It's amazing how much pain one can suffer. My joints ached; I could barely make it up and down the stairs. My blood pressure was high, I couldn't concentrate, and I was so embarrassed about my weight I didn't want to see anyone. I didn't talk to anyone or go anywhere. I had anxiety attacks constantly. I slept much of the time. I was dying – inside and out, but kept rationalizing "It wasn't that bad. If I really wanted to quit I could." That thinking went on for years, until it was almost too late. Gradually my thoughts were "I've had a good life, travelled, had good friends, family, good jobs, etc," coming to the conclusion that I was fine with my life being over. My HP had other plans. I started my journey to a new life on Valentine’s Day, 2013. A friend (my only friend left) called to tell me about COR Retreat three days before it was to start. I checked out the website and it looked good, but I had been through other eating disorder programs and was quite hesitant. What if I fail again? If I would have had more time to mull it over would have talked myself out of it. Thank God I didn't! Walking through the doors at the McIver Center was my ticket to a new life. Yes, I was scared to death but I knew this was my last hope. Something happened – I could feel myself giving up. I gave up trying to do it "my way." I was tired. A little corner of a window opened . . . "was it possible to live without sugar?" Sugar was like crack to me. I would almost hyperventilate at the thought. Being at COR Retreat around others who also struggled with this was a comfort. I had felt so desperately alone, but now I was with people who understood. The first night we learned that this "problem" had nothing to do with willpower, something I always thought. Ashamed most of my life for not succeeding in dieting, or succeeding but always gaining back, plus more, always dieting, always failing. Learning that sugar is, in fact, a real addiction was truly an eye-opener. I had been taught in previous programs that there are no "bad foods. We just need to learn to control them." COR Retreat taught me that YES, THERE ARE BAD FOODS! And no, we CAN'T control it. What a relief!! I had been looking for this all my life! My brain chemistry is such that some things are poison to my body...I was never expected to control it! It makes so much sense! Gradually, as the days passed, with the gentle nudging, teaching and compassion of Michelle G. (my Angel here on Earth) I let my walls down enough to see the REAL truth. 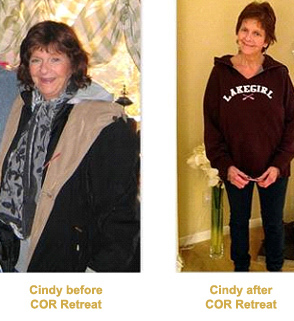 I know, without a doubt, COR Retreat saved my life. I learned that this addiction is not my fault and I'm not meant to do this alone. Being a loner most of my life, this is difficult at times, but the longer I am abstinent, the better I feel – physically, emotionally, mentally. I no longer have anxiety attacks, can walk (even run) the stairs, my blood pressure is lower, and I have a new and wonderful appreciation for life, the program & my higher power. My life is not over, it's just beginning!!! How do you say "thank you" for saving a life? There are no words...... Michelle, Burt & COR Retreat = gift of life.